It’s “Puss” in Boots that steals the show in the new Shrek spinoff, and I must admit that the decision to leave the big green ogre and donkey out, was the right one. It isn’t deep or groundbreaking, but what it lacks in profundity, Puss in Boots more than makes up for with an abundance of wit, visual sparkle, and effervescent charm. 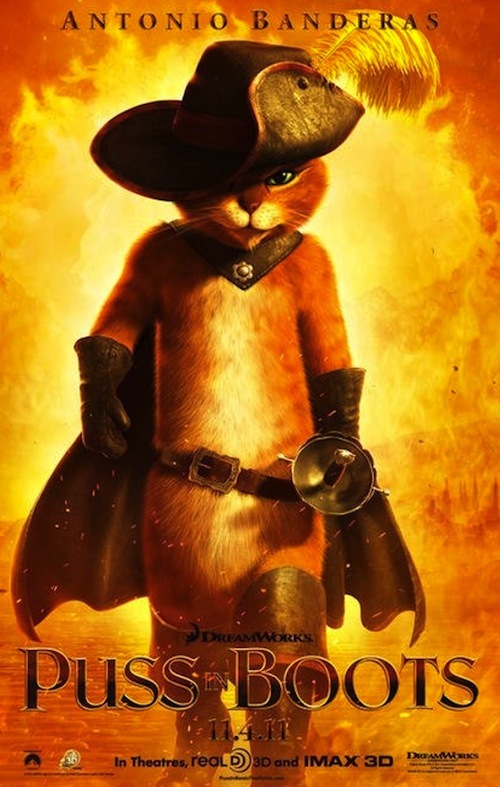 The story revolves around the history of the charming and charismatic Puss In Boots, (voiced by Antonio Banderas) before he meets with Shrek. His best friend while growing up in an orphanage for abandoned boys and fairytale characters is the bad egg, Humpty Dumpty (voiced over by Zack Galifiankis). Humpty eventually betrays Puss, which destroys the friendship and pushes Puss in Boots to become an outlaw. Just when you were about to give up on 3-D—and the inflated price of admission to watch it on a theater screen—along comes a film that’s worth the money. In fact, it isn’t the story that makes Puss in Boots stand out, but the imaginative staging, especially in 3-D. Whether it was the feeling of flying with shots zooming over the animated desert or the beanstalk scene when Humpty, Kitty Softpaws and Puss In Boots make you feel like they are falling into your face, there is no denying that it is one of the best 3-D animated films to date. Puss in Boots is sure to delight and the best thing about it, is that it captivates with twists on classic fairytale stories while leaving out the ‘gross factor’ that is so prevalent in Shrek series. Puss in Boots is Worth Seeing.